This week marketing software firm HubSpot, famous for its own inbound marketing, added a new component to their suite of marketing software. And darn, it was a fresh new email marketing tool. Even more interesting than the fact that HubSpot did this, is the reason why. And why now? 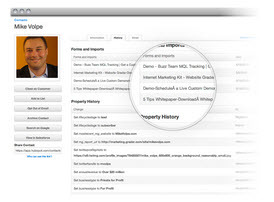 The HubSpot marketing software tools have been around since 2006. But back then HubSpot saw the email space in a different light than they do today. The ex-MIT co-founders Brian Halligan and Dharmesh Shah, started HubSpot with the premise that “traditional marketing was broken” and the tools needed to do inbound marketing were too complex and disconnected. But there was a need for better email marketing tools as well. Note that the company currently has almost 7000 users and has managed to get over $65 million in Venture Capitalist backing (included in that is Google Ventures). They aren’t a small player, but didn’t venture into email marketing that hard before. Around three years ago they built some email marketing and lead nurturing functionality into HubSpot Software, but now the whole email marketing piece is built up again from scratch. It seems to be a trend to add and integrate different marketing software functionalities together in suites. Integration brings the promise of easy data management, less technical hassle and a better overview of the customer and her touchpoints. Just last month Terradata announced that they were adding email marketing tool eCircle to their own suite data and the marketing management capabilities of Aprimo. And we have seen several ESPs adding social media capabilities to their email marketing tools. Last year HubSpot purchased Cambridge start-up Performable, they were at the time developing analytical tools for measuring online campaign effectiveness. Performable developed software for analyzing sales and marketing performance, which had triggers for sending email messages based on a visitors’ prior interaction with the company. The 18-person team moved over to HubSpot. HubSpot marketing manager Jessica Meher: “One of the team’s first projects was to develop an e-mail marketing platform that was tightly integrated with the rest of HubSpot’s offerings. “We weren’t interested in email marketing as a silo.’. We haven’t played with the new tooling just yet. From judging from their own email tool page, I think they know what their current clients are looking for. I sell shopping cart software, and I have a killer new ebook on fashion industry ecommerce; I build a list of the people who found my site via related keywords, I send an email to those people including the new ebook, then I re-purpose the same email to get sent as part of an email marketing automation campaign to new visitors who found the site via the same keywords. That’s the kind of targeted, relevant emailing that produces great conversion rates. Is email the answer or adding to the problem? We asked Rick if he thinks email is the answer to the loudness and overflow of info in the online and social media space. That depends on the kind of email — traditional email just adds to the problem. Targeted, relevant email sent using segmentation like’s HubSpot’s does help solve the noise problem. The reason is simple: If your message isn’t relevant, it’s not useful to the recipient. If it’s relevant, it’s useful.